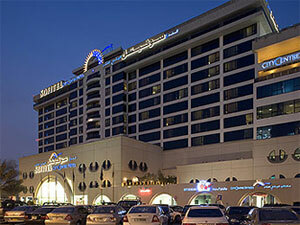 City Centre Hotel & Residence Dubai - Dubai Hotel Located in Dubai City Centre, Dubai Shopping Area and Dubai Business District! This 4-star hotel is located few minutes' driving from Dubai Airport, close to the World Trade Center, and right next to the Deira City Shopping Centre. The hotel offers several restaurants and bars including an international brasserie, patisserie, an English pub and a lounge bar. The business centre has 11 fully equipped meeting rooms for up to 450 people. The great variety of leisure facilities at the City Centre Hotel & Residence include tennis and squash courts, a gym, and an outdoor swimming pool.